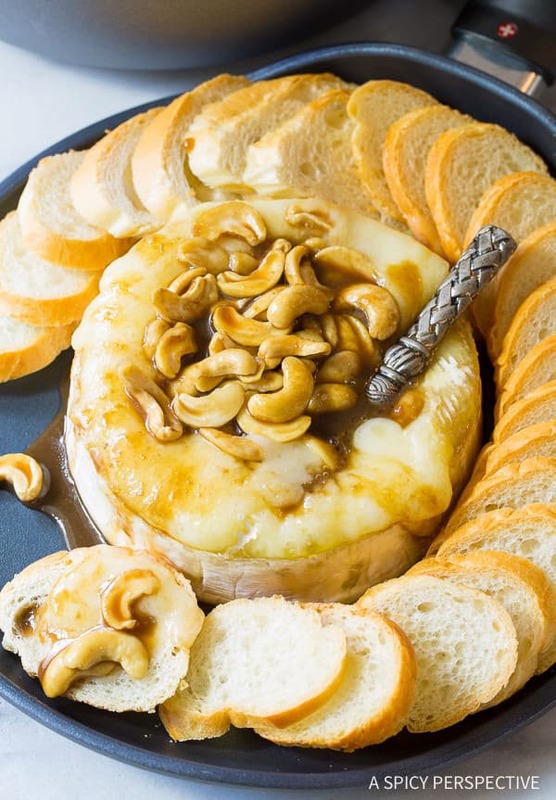 A holiday classic that can’t be beat… steaming molten Baked Brie with Cashews and Bourbon Brown Sugar Glaze served with baguette slices. Some recipes never get old, like a classic baked brie. Every holiday season I fall head over heals (again) for this oozing hot liquified cheese appetizer. Baked brie can be prepared in many different ways. Some like it cut and baked on toast, or a whole wheel of brie wrapped in puffed pastry is another common rendition. 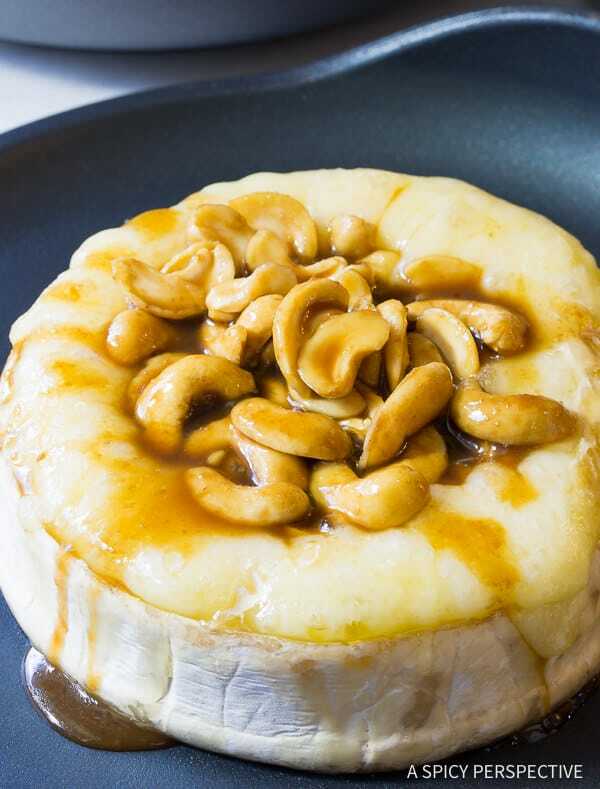 However, a naked baked brie topped with boozy sticky sweet cashews is a personal favorite I like to surprise my holiday guests with each year. You can bake a whole wheel of brie without additional ingredients necessary, by simply severing the top rind all the way around the edges. The bottom and sides hold the brie, like its own little built-in serving dish, while the top piece acts as a lid while baking. Then gently lift the lid off and you have hot spreadable brie that is great on bread, crackers, or even with veggies! I like to bake the brie on a Swiss Diamond Nonstick Crepe Pan for several reasons. 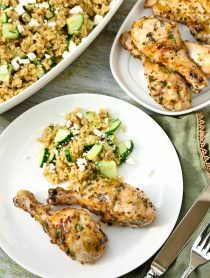 One, the healthy and completely nonstick surface makes cleanup super easy. Two, the shape of the pan means I can adding toppings and baguette slices right on the pan and serve it straight from the oven to the table. And finally, serving the baked brie on the pan means it stays melted longer, so my guests have plenty of time of snacks and chat. 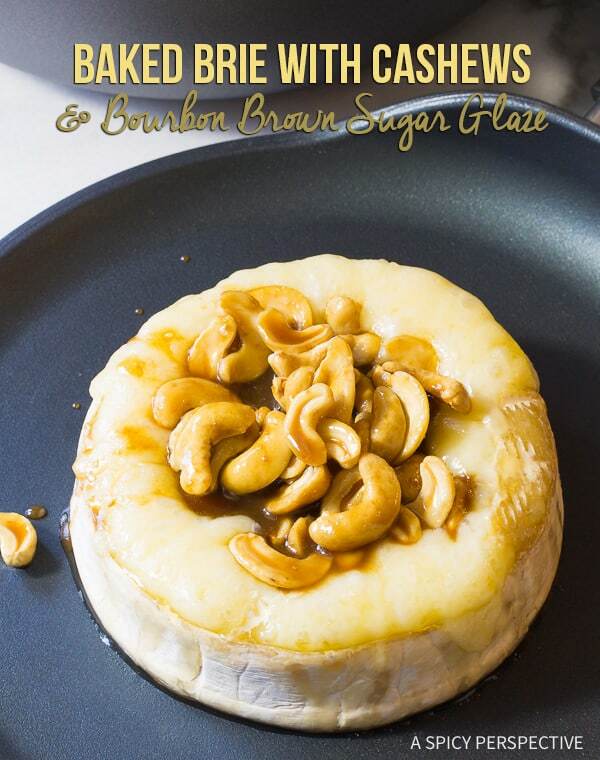 While the brie is in the oven, whip up an easy topping of Cashews with Bourbon Brown Sugar Glaze (AKA bourbon caramel) to spoon over the top. 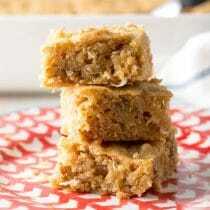 Combine bourbon and brown sugar in a small Swiss Diamond Nonstick Sauté Pan. Allow them to simmer, then add in cashew halves and simmer a little longer for the caramel sauce to thicken. 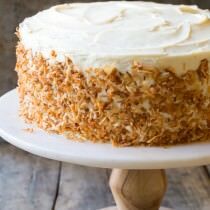 Add a touch of cream at the end, and you have a decadent nutty glaze that pairs perfectly with the rich salty cheese. You’ll be amazed at how easily the pan washes clean. Even with caramel in it! 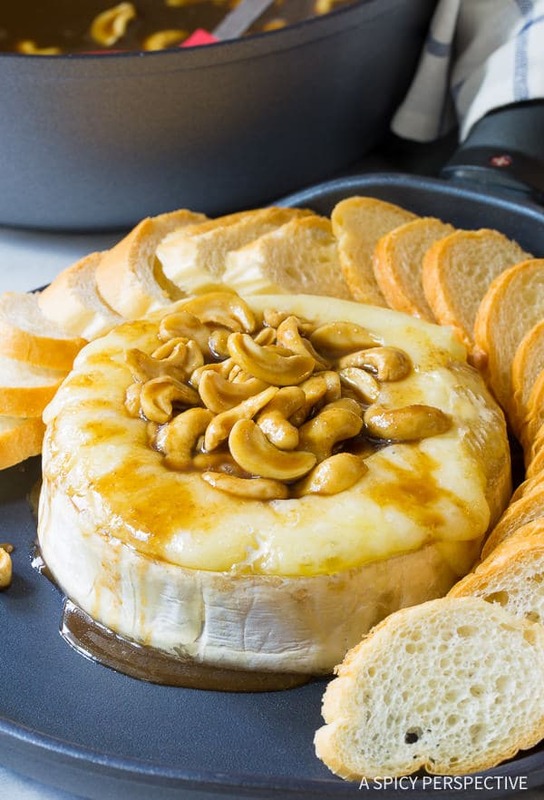 While the Baked Brie with Cashews and Bourbon Brown Sugar Glaze is hot and runny, place fresh baguette slices around the brie and serve it straight off the crepe pan, so it stays warm longer. This heavenly appetizer is always a welcomed addition to any party. In fact, it’s nearly always the first thing to disappear! 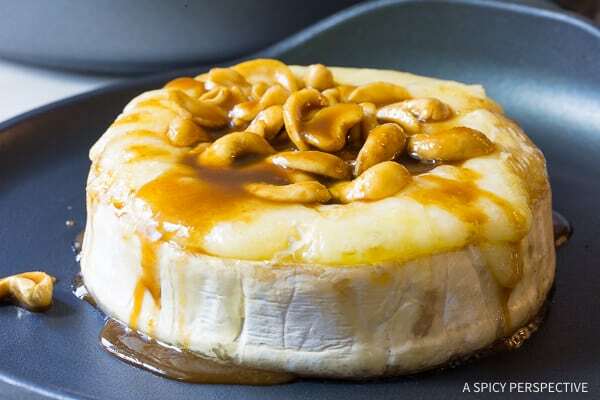 No one can resist Baked Brie with Cashews and Bourbon Brown Sugar Glaze. 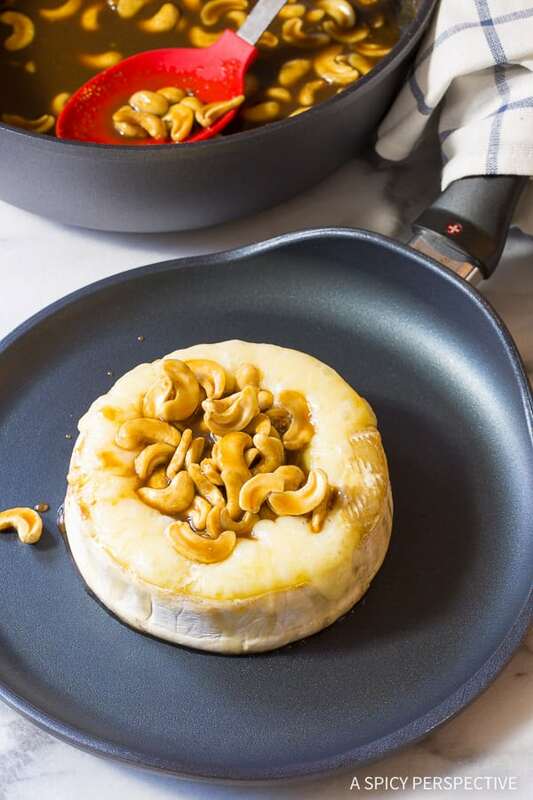 Easy 7-Ingredient Baked Brie with Cashews and Bourbon Brown Sugar Glaze, perfect for holiday parties! A decadent appetizer is something we always make during the holidays. Preheat the oven to 350 degrees F. Carefully cut the top edge of the brie rind, all the way around the wheel, so it can be removed later. Cut deep enough to separate the papery rind layer from the brie, but leave it on as a lid. 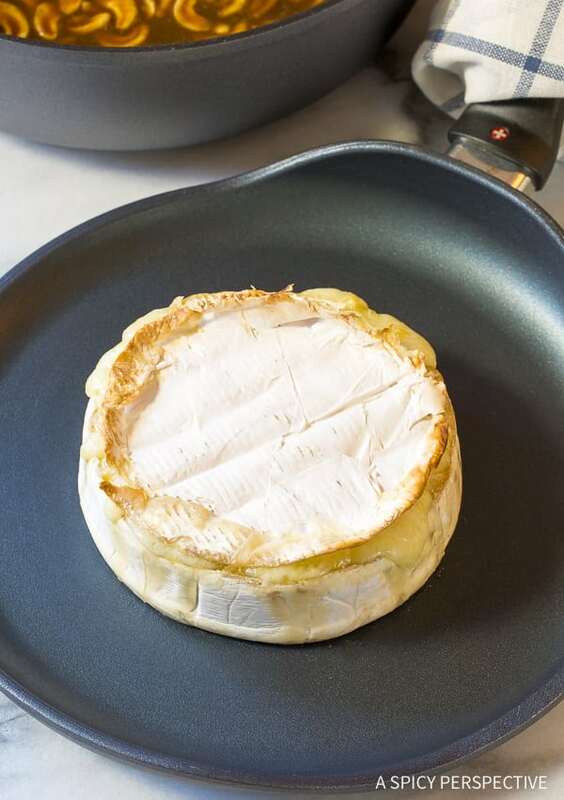 Place the brie wheel in the center of a Swiss Diamond Nonstick Crepe Pan and place in the oven to bake for 15-20 minutes, until the brie has liquified. Meanwhile, Place a small Swiss Diamond Nonstick Sauté Pan over medium heat. Add the bourbon, brown sugar, vanilla and salt. Simmer for 5-10 minutes until the brown sugar has fully dissolved and the mixture has thickened a little. 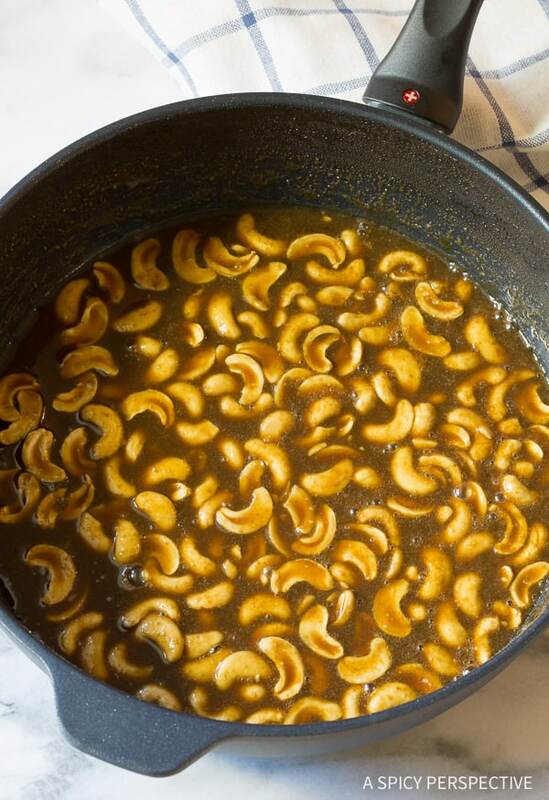 Stir in the cashews and simmer another 5 minutes. Then stir in the heavy cream and turn off the heat. 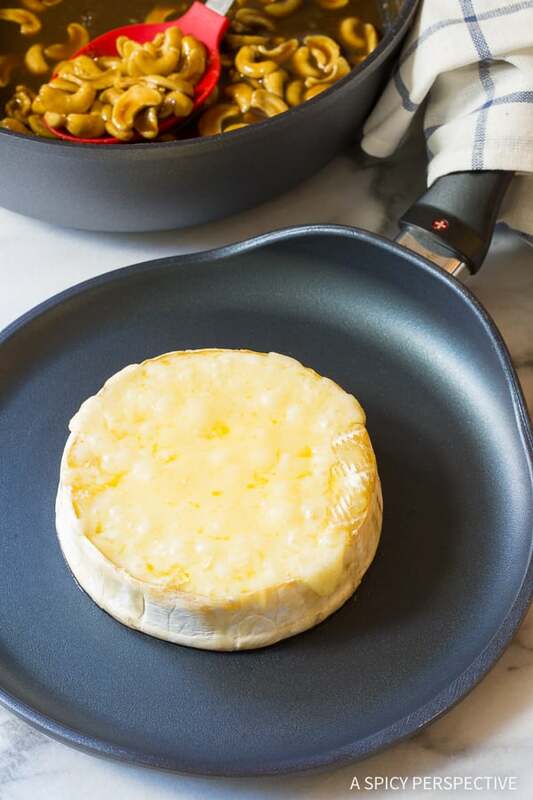 NOTES: You can use a skillet or shallow baking dish instead of a crepe pan for the brie. However, I like the shape of the crepe pan for this recipe and the handle for moving it in and out of the oven. Disclosure: The post is sponsored by Swiss Diamond Cookware. All opinions are my own. I can never say no to baked brie! I love baked brie and it’s always such a fun appetizer to set out at parties! 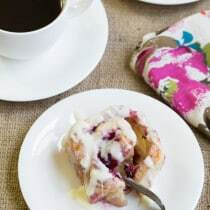 Loving that glaze! 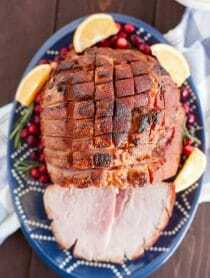 That glaze with the brie…perfection & such a great holiday appetizer! 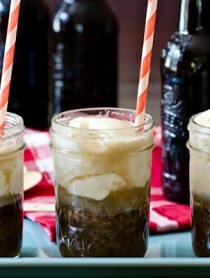 Oh wow yum! This baked brie looks aMAHzing! I just won a set of Swiss Diamond pans at the Southern Food Blogger Retreat and I am in LOVE! so creative and looks fabulous for the holidays! I will never pass up a plate of melted cheese and gooey glazed topping!! There is never not a time that baked cheese doesn’t sound AMAZING!!! 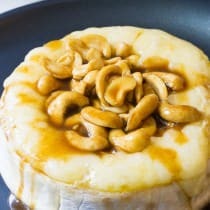 I already love baked brie but I might love it even more with cashews and bourbon. Hello appetizer deliciousness! Now, this is how you should entertain during the holidays! Love baked brie! 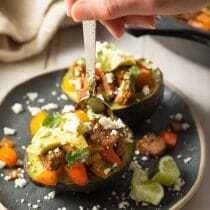 Everything in this appetizer is so perfect for holiday entertaining! Oh my, perfect for entertaining.